Please see attached picture, when using Notes (iOS version) there´s this "Delete this note" option. Can it be removed or somehow hide? i just Hate it! there´s no "Delete this note" option at all, which is cool. p.s. iPhone is my work phone and Android is my personal phone. Not sure this answers your question (or applies to your comment), but the Android version has the "Trashcan" in the header which is the Delete function. To clarify. You are asking to remove the option to delete a note? Not sure why that would be necessary, or how it would be implemented. 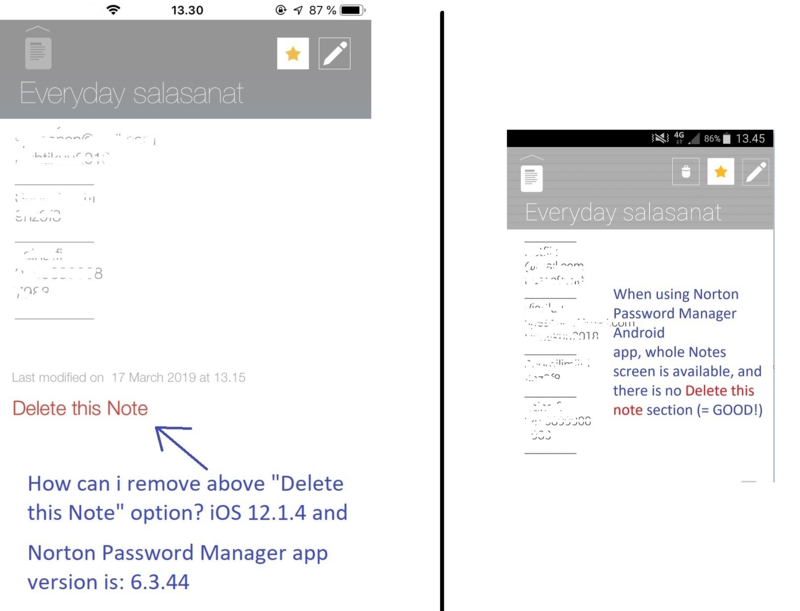 The user is always going to want the option to delete a note they no longer need, or they find contains sensitive information that should not be there any more if the device is to be shared between different users. If this is your question, there is no way to remove that feature. And as yank notes, the option is there in the Android version. Just not presented the same way. Sorry, English isn't my first language, I try to clarify. and i´m not looking any solution to remove the option to delete a note. when i´m scrolling my notes, and that´s sad.